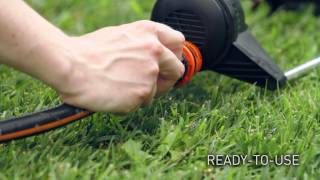 Compact oscillating sprinkler for small gardens (up to 181 sq.m.) made in particularly shock-proof plastic material and waterproof aluminium. The large turbine guarantees top irrigation performance using only the power of the water. You can choose from 4 different water settings for tailored, waste-free irrigation, thanks to the specific selector. Oscillating sprinkler, 14 precision punched water holes providing uniform distribution with natural rain effect. Control knob for selection of 4 main spray patterns with many intermediate steps.